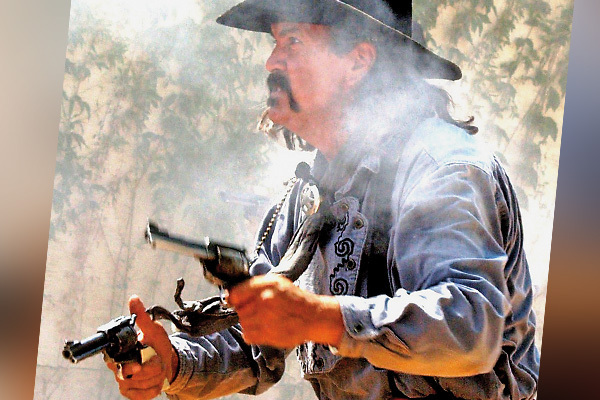 While working as a Disney Studio animator, Dr. Buck Montgomery, a former bulldogger in the California rodeo circuit, began working as a Hollywood stuntman to supplement his income. Mentored by the stunt double for John Wayne, he ended up working in films such as The Sacketts, The Long Riders, Pale Rider and Back to the Future Part III. He went on to work as the entertainment director at Ponderosa Ranch (theme park for NBC’s Bonanza) and ended up producing his own history-meets-Hollywood festival, the Wild Western Festival, in Glendale, Arizona. He’s also the trail boss for SASS’s Wild West Performing Arts Society.